I don’t know why it is (perhaps it’s a holdover from the days when Rice Kernel couldn’t chew whole pieces of meat), but I frequently pick up packages of ground chicken. I’m tempted to make burgers often, but Rice Kernel still eats burgers deconstructed – meat first, and anything else maybe. To accommodate the little guy, this is another delicious and quick use-up for healthy ground chicken. Break the bread into pieces. 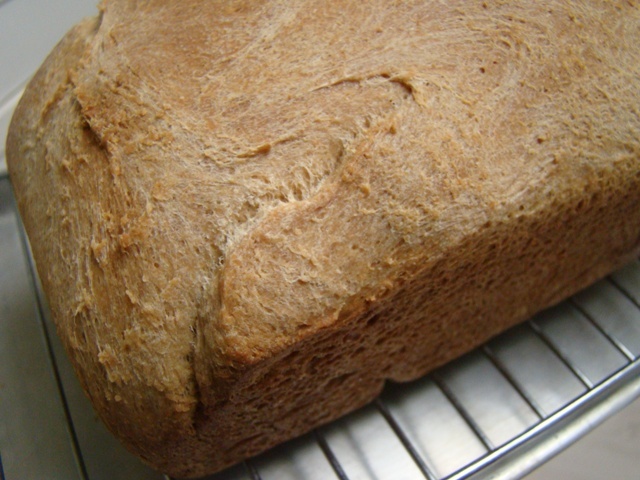 In a large bowl, soak the bread in the half-and-half until the liquid is absorbed, about 2 minutes. Mix in the chicken, egg, salt, pepper, dill. Put in the freezer for about 10 minutes to firm up. We’re not the greatest duck afficionados. But, for a flavorful (fattier) change of pace, this dish was a delight. We added spinach, roasted red bell peppers and shallots for a one-dish meal – perfect for the waning energy levels at the end of pregnancy…. To slow roast raw duck legs, first pat them dry. Prick skin all over with needle to help render out fat. Salt all over generously. Place skin side up in a 300°F oven in a casserole dish just small enough to fit them without overlapping. Cook for about 90 minutes or until the skin starts pulling away from the bones and getting crispy. Turn up the heat to 375°F for 15 minutes until duck starts to get light golden brown. Remove from oven and let cool for 15 minutes. Pick all the meat off the duck legs and reserve the skin. Tear the meat and skin into smallish pieces. Heat a large sauté pan over medium-high heat for 2 minutes. Add the butter and the duck meat and skin. Turn the heat down to medium. Put the pasta in the boiling water. Stir it from time to time. Add the garlic to the sauté pan and mix well. Watch the garlic: The moment it begins to brown turn off the heat. Drain the pasta when it is al dente, or use tongs to take it from the boiling water right into the sauté pan. Turn the heat back on to medium. 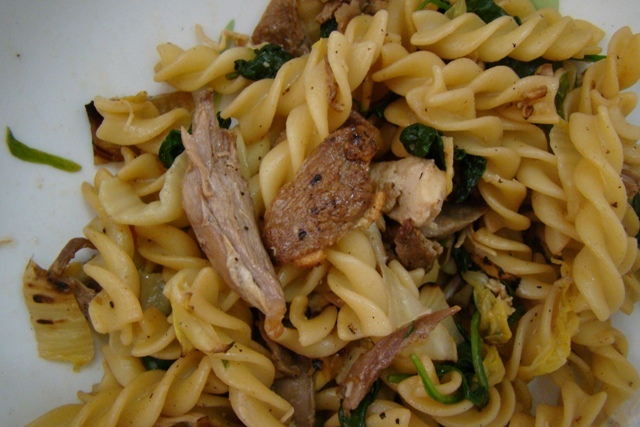 Toss the pasta in the sauté pan, making sure it is all coated well. Add more duck fat if needed. Add some black pepper and 1 tablespoon of the lemon juice and toss again. Taste and add the second tablespoon of lemon juice if you want. I was in the mood for something different and came across this bread. This loaf is moist with some fun crunch. You can change the seeds or omit entirely. The dough itself is mildly sweet and extremely satisfying. While our loaf didn’t rise as much as other reviewers suggested it would, I enjoyed the denser, moist texture. It’s delicious for french toast. Beat in the seeds and molasses. Add the remaining bread flour gradually, beating all the while, until the dough has formed a smooth ball. Knead for 3 to 5 minutes on medium speed. Turn the dough out onto a lightly floured surface and knead it briefly; it should be smooth and elastic. 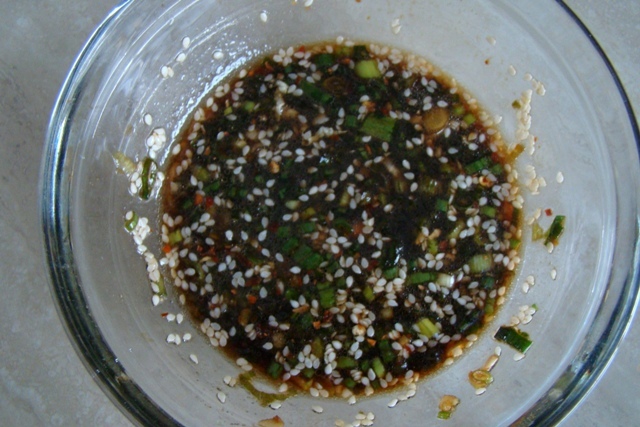 Place the dough in a lightly greased bowl, turning it so the top of the dough is coated with a thin film of oil. Cover it with plastic wrap and let it rise until doubled in size, 1 1/2 to 2 hours. Punch down the dough, divide it in half and shape each piece into a loaf. Place the loaves in two lightly greased 8 1/2 x 4 1/2-inch bread pans, cover with plastic wrap and let rise until the dough has crowned 1 inch over the top of the pans, 1 to 1 1/2 hours. Bake the bread in a preheated 375°F oven for 40 to 45 minutes, or until an instant-read thermometer inserted in the center of the loaves registers 190°F. Turn the loaves out onto a wire rack to cool completely. With the Lunar New Year celebration underway, Asian-themed food blogs I read have been replete with recipes for the occasion. This is one that caught my eye. A fairly simple roast chicken recipe (which I can always use for the frozen organic birds in the freezer), this Chinese-style dish is delicious and imparts the signature Cantonese BBQ aroma and flavors from restaurants and Asian supermarket delis. It’s the perfect meaty, juicy main dish for my pregnancy-protein cravings – and we’re almost there…. a few weeks left. Picture does not do justice for the color/texture of the crispy skin. Clean the chicken with water and pat dry inside and out. Truss the chicken. Heat up the oven to 400 Degrees F. Place the chicken in a roasting pan and roast for about 12-15 minutes on one side and then turn to the other side. 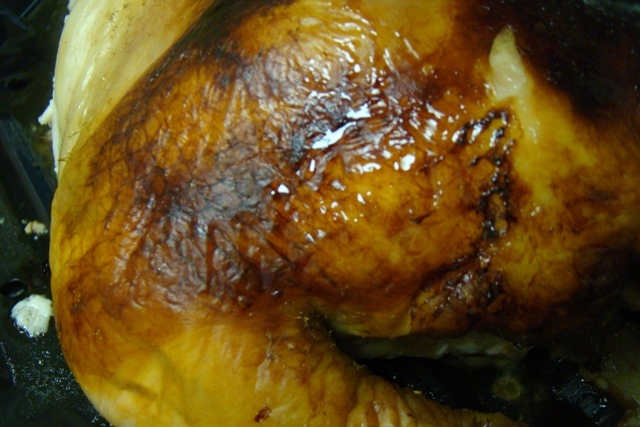 Roast for about 45 minutes or an hour, until the skin is golden brown. Remove from the oven, rest 10-15 minutes, cut and serve. Save the juice from the chicken and serve with steamed rice. Meanwhile, mince and mash garlic to a paste with a pinch of salt. Stir together with remaining ingredients. I love cinnamon rolls. I have always loved cinnamon rolls. From the mall to airports to the supermarket, I always think about buying one or a dozen. 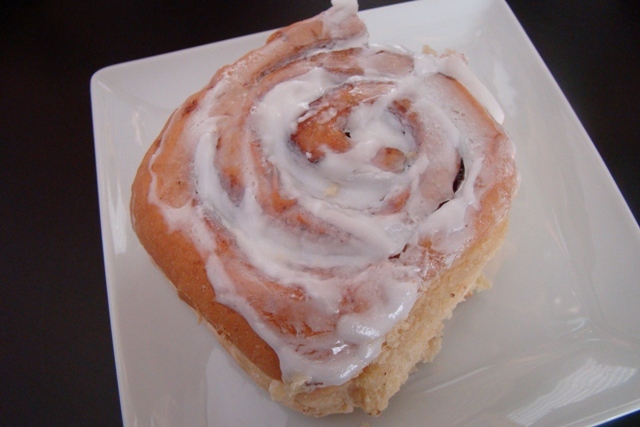 When I was pregnant with Rice Kernel I bought my share of cinnamon rolls from our local supermarket, Mollie Stone’s. Somehow Mollie had produced a delicious – but not decadent – roll that was 97% fat free and made mostly with skim milk. Not one to experiment with yeast doughs back then, I never tried to recreate my supermarket craving. Since then, I’ve come across numerous “healthier” versions, but most still call for a substantial amount of fat in the dough and then in the filling. I’ve come close to making Vivienne’s rolls at Green Cilantro (lightened with applesauce). Then I came across this recipe…. this is really a lightened roll. I was curious. I added Vivienne’s applesauce touch and voila – it was just perfect for my (second) pregnancy sweet tooth. Transfer warm milk to a large mixing bowl and beat in half the flour by hand or with an electric mixer. Mix in enough remaining flour to make a soft dough. Let rest 10 minutes; knead well on a floured board or with an electric mixer and dough hook; let rest 10 minutes. Lightly coat a 9-inch round baking pan with cooking spray. Turn the dough onto a floured surface and roll into a 12 x 10-inch rectangle. Spread butter (and applesauce, if desired) mixture. Sprinkle cinnamon, nutmeg, and sugar. Optional: Add raisins, cranberries, nuts, etc. Roll up tightly, like a jelly roll. Cut into 12 pieces. Place buns cut-side up in baking pan. Cover with plastic and let rise until doubled, about 1 hour. Bake buns until firm and nicely browned on top, 30 minutes. Combine all ingredients in small bowl until smooth. You can also use orange juice and zest or water/milk for no citrus flavoring. Rice Kernel and I don’t exactly love eggplant. I eat it, but I rarely buy it when alone. Then there’s FHE. He loves eggplant. In fact, he somehow convinced me to grow eggplant this summer. (Lucky for me, not our most prolific vegetable in the garden.) Last week, while grocery shopping together, FHE somehow snuck in several eggplant. “What should I cook with these?” I asked him. “Whatever.” Uh huh. Wish I could say that when I buy his “favorite” squash…. My standard eggplant dishes are either tomato-sauce based (pasta with meat sauce or pasta alla norma) or asian-influenced in a spicy or gingery stirfry. Seeking an alternative that I thought I could sneak by Rice Kernel, I decided to make chicken and eggplant parmesan stacks in sandwich form. I couldn’t sneak the veggie by Rice Kernel, but there’s no denying some crusty bread around his favorite chicken parm recipe. If you’re not in the mood for tomatoes, pesto is as delectable. I often say to friends that Rice Kernel has two best buds – his grandpa, my Dad, and his own Dad, FHE. Rice Kernel and my Dad. Two peas in a pod. They are goofy together and, frankly, Dad tolerates the little guy and let’s Rice Kernel use his iPad, camera, play in his car, and ride him around the house like a pony. Dad and I are certain I never had most of those privileges. Alas. Grandparents and their grandchildren. The two also seem to have some similar eating habits and preferences when it comes to meals and snacks. Except that Rice Kernel has a raging sweet tooth and benefits from being the grandson of a gelato maker and my Dad, well, has no sweet tooth. But that’s for another day. This is another one of Dad’s favorite ingredient combinations. We’ll see how Rice Kernel receives it…. As for the recipe itself, we tend to use day-old rice (it’s drier and works bests) reheated in a scant amount of olive oil, salt, white pepper (Dad’s preference), and a touch of soy sauce, if you choose. Pull the rice off the heat and saute one large, chopped onion (the more the merrier for Dad here) until tender. Add 2-3 scallions, chopped, and the amount of chopped chicken you desire until heated through. Season with salt, white pepper, and sesame oil. Add it to the bowl with rice. Lastly, add a scant amount of oil and cook 2-3 eggwhites, scrambling them as they cook. Once barely cooked through, toss the rice mixture to reheat. Season, if necessary, and serve.